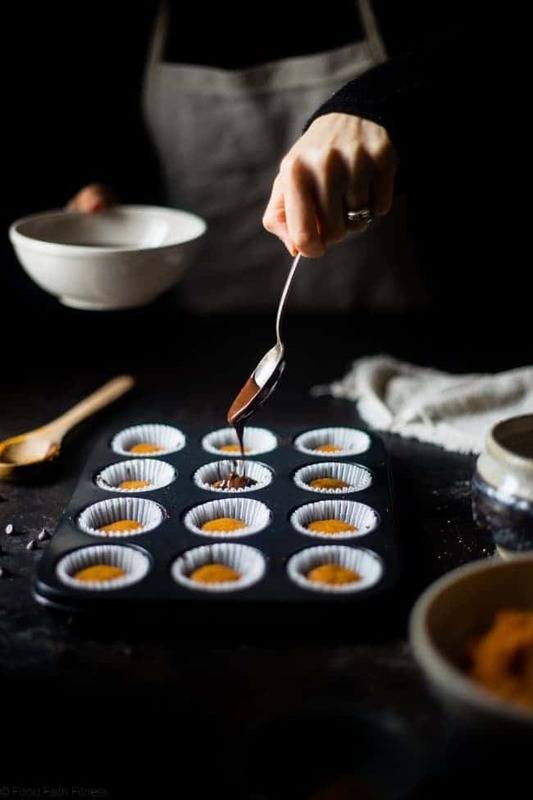 Just letting you know that these ADDICTING, salty-sweet pumpkin edible cookie dough cups are sponsored by my awesome friends over at Love With Food! 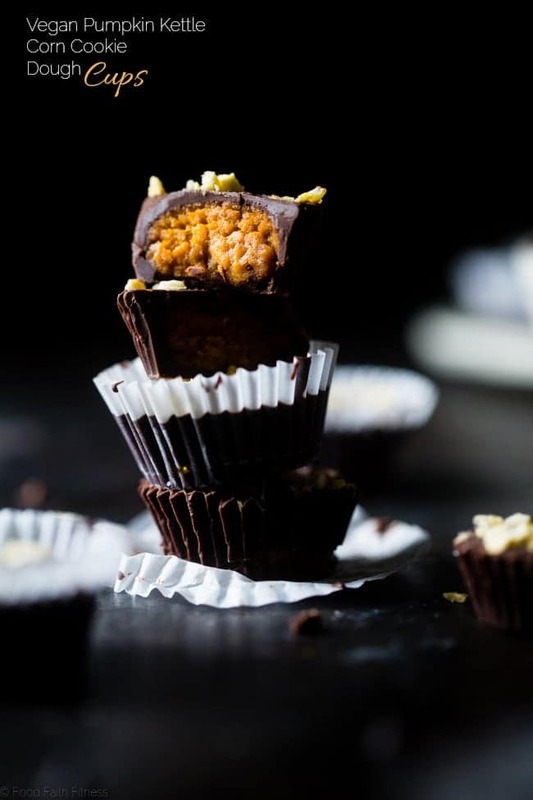 These edible cookie dough stuffed chocolate cups are topped with salty-sweet kettle corn! They’re a quick and easy, vegan-friendly dessert that are only 95 calories and 3 SmartPoints! 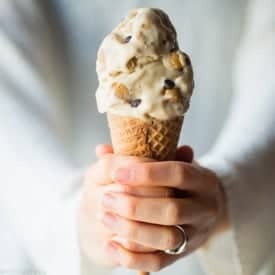 EDIBLE COOKIE DOUGH. With PUMPKIN. Holy flying monkeys right now guys. I’m just sitting here trying to put my words and thoughts and general pieces of BRAIN EXPLOSION because oh-my-gosh-so-yummy back together right now. I ALMOST can’t handle these. And “almost” as in no-you-did-not-just-see-me-wipe-a-chocolate-shmear-off-my-cheek-because-my-form-of-“handling”-is-eating-them-all-in-ONE-sitting. Alright, deep breaths. Innnnnn and oooooout. <– Talking to myself. You do it too. No lying. These are the kind of bites where the ideas of yumminess just kind of snowball (too soon for a snow reference?) off each other. It started with an edible cookie dough recipe. Then, how about PUMPKIN for the trendy, Pin-a-bility? OH OH OH!!! Peanut butter? Everyone loves peanut butter. Now. Eat ALL the cookie dough at once because YOU CAN when it’s T-H-I-S edible cookie dough without butter! Making edible cookie is the easiest thing in the world! You just need to find a few pantry essential ingredients. We’re using peanut butter, powdered peanut butter, canned pumpkin and pumpkin pie spice. Beat together the pumpkin and peanut butter until smooth and fluffy, just like normal cookie dough! Stir in the peanut flour and pumpkin pie spice until well mixed, and stick it in the fridge to chill! VOILA! 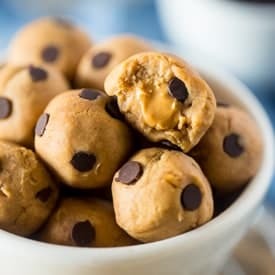 Easy, eggless vegan edible cookie dough! And there you have it. What goes on in my mind when I recipe develop. It’s sort of a scary place, but it makes sense to me. 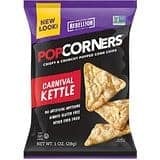 It just so happened that, as these ideas were rolling out of my brain, I had both Peanut Butter & Co Peanut Butter Powder and Popcorners Carnival Kettle Chips (remember the magical combination in the peanut apple bites?) in my latest Love with Food snack box! AKA: ALL the secret ingredients to reach pumpkin-cookie-dough cup H-E-A-V-E-N.
You guys remember when I introduced you to their S-U-P-E-R fab subscription snack box in the vegan mug cake with lemon macaroons last month yes? How COULD you forget a happy-colored-red-box that comes straight to your door, fulfilling EVERY SINGLE healthy snack goal that your always-hungry-needing-snacks self could even DREAM UP. Not to mention, they even donate a portion of the proceeds to help fight childhood hunger in the U.S and around the world. This month we’re continuing the challenge to make a snack out of a snack. WHILE snackin’ smart and doin’ good. I feel like that can only be the most perfect combination of events ever. I feel like you TOTALLY agree with me on this. The kettle corn topping shenanigans that is supremely addicting with it bursts of crunchy, salty-sweet YUM came from the peanut apple bite bites with kettle corn and caramel apple peanut kettle corn bars that we shoveled into our fall-flavored-food loving mouths last week. 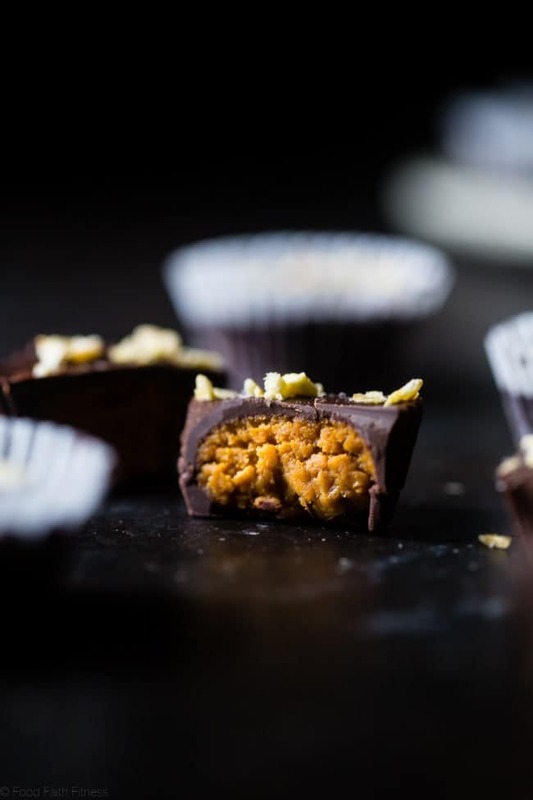 I know you love a plain homemade peanut butter cup (because, uhmmm, CHOCOLATE) but just THINK about an extra delicious punch of fun surprise topping WITH said chocolate cup. 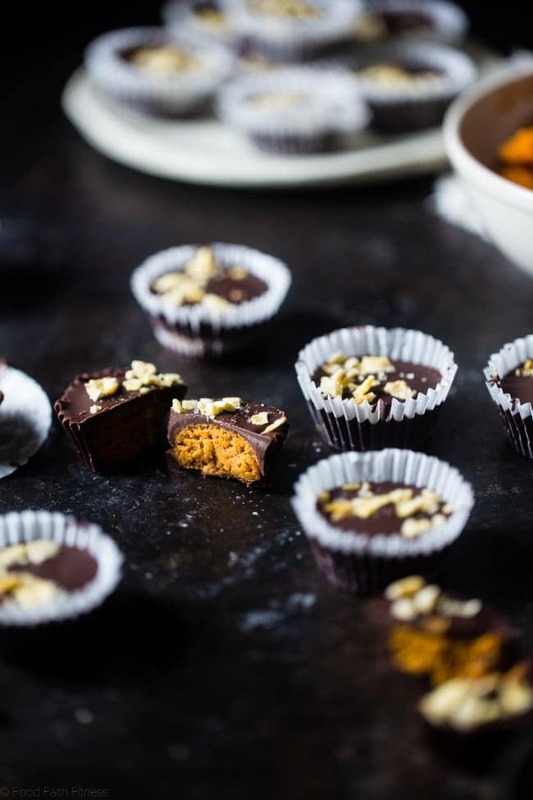 A-N-D once your tongue tastes the salty chips, wiggles its way through a rich, deep, dark chocolatey PUNCH and then ends in a soft chewy spicy-sweet pumpkin AND peanut-butter flavored vegan COOKIE DOUGH center? For once in my life, I have ZERO WORDS for the these pumpkin edible cookie dough cups. Don’t wanna talk about them. Just wanna eat them. All day long. Gimme cookie dough stuffed chocolatey cups for breakfast lunch and dinner, and I’ll just sit here and be super happy about my current life situation. I don’t usually like to put so much pressure on a recipe by calling it my FAV, but these can stand up to IT. They know what’s UP and SO DELICIOUS. 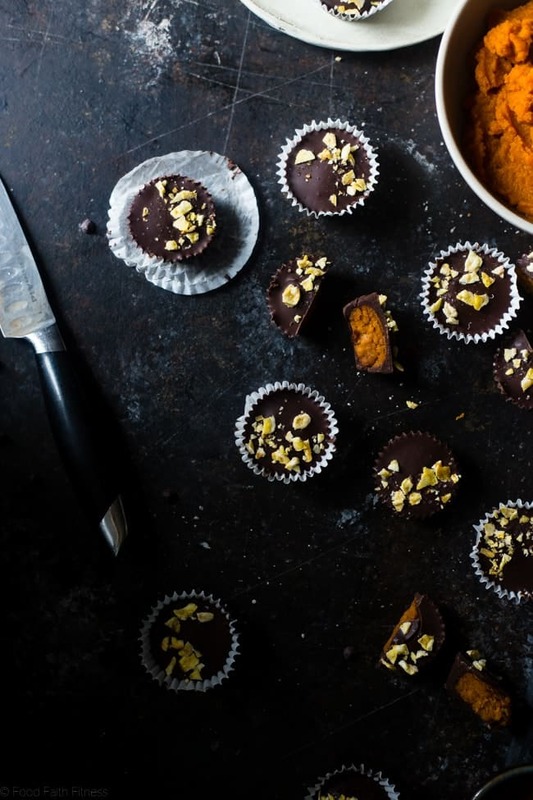 These pumpkin edible cookie dough cups can handle such a prestigious, superior title. Probably a lot better than I can handle myself AROUND THEM. You’ll know what I mean when they, SOME-UNKNOWN-WAY, vanish out of your refrigerator too. Chocolate-cheek-shmear is giving away NOTHING. 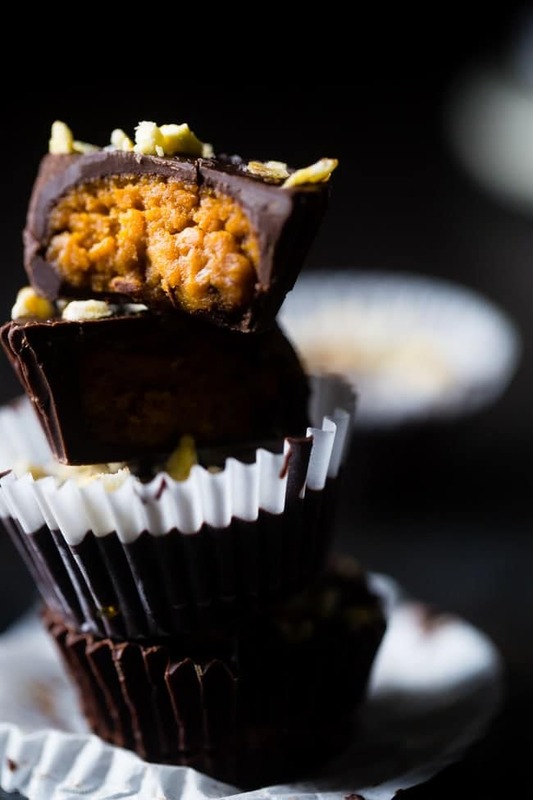 These pumpkin edible cookie dough stuffed chocolate cups are topped with salty-sweet kettle corn! They're a quick and easy, vegan-friendly dessert that are only 95 calories and 3 SmartPoints! 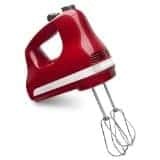 In a large bowl, using an electric hand mixer, beat together the pumpkin and peanut butter until smooth and combined, scraping down the sides as necessary. 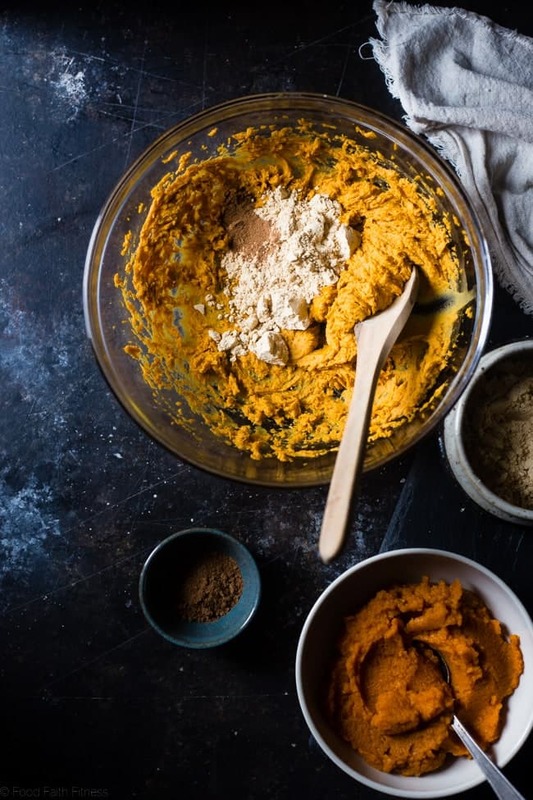 Stir in the peanut flour and pumpkin spice. Place into the refrigerator to set while you melt the chips. 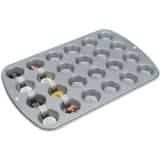 Line a mini muffin tin with mini muffin liners (you'll need two - but you can also just put the liners on a plate and fill them, they just don't keep their shape as nicely.) Spoon a small amount of chocolate into each liner, just enough to cover the bottom, and use a small spoon to spread out evenly. Scoop heaping 1 Tbsp balls of the cookie dough and roll into a ball, flattening slightly to form a patty that is JUST smaller than the muffin liner. Place one ball into each liner. You want there to just be a tiny crack of space between the cookie dough patty and the edge of the liner. 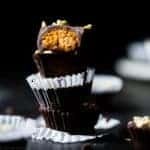 Fill each muffin liner 3/4 of the way with the remaining chocolate, covering the dough, gently shaking the pan so the chocolate is smooth and flat. Sprinkle the tops with the crushed chips and optional sea salt. Place into the refrigerator to harden for 30 minutes to an hour. Store leftovers in the refrigerator - the freezer makes them too hard! THIS POST IS SPONSORED BY MY FRIENDS AT LOVE WITH FOOD. THANK YOU FOR ALLOWING ME TO CONTINUE CREATING GREAT CONTENT FOR YOU BY SUPPORTING PARTNERSHIPS WITH SUPER-FAB BRANDS THAT FOOD FAITH FITNESS LOVES TO WORK WITH! AS ALWAYS, OPINIONS REMAIN 100% MY OWN! Want more vegan cookie dough recipes? These little cups of awesomeness look amazing! Love all the flavors, and your photos are incredible! Well done! This is such a fun idea! I’ll have to give it a try sometime! I think you would love! Thanks! I love that you combined some of the best ingredients into these tasty little bites! I don’t think I would be able to stop eating them. 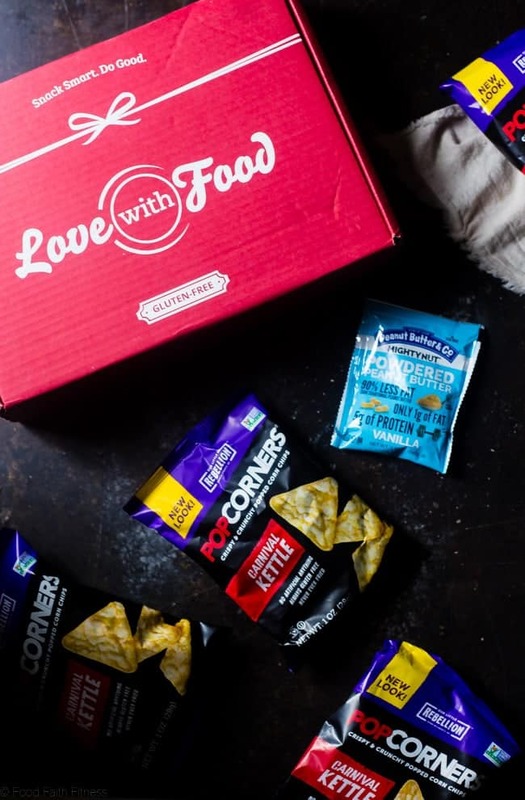 I love trying new snacks and treats so I definitely need to check out the Love with Food boxes. 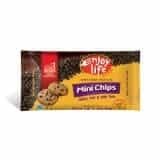 You would love them then – such a fun way to learn about new snacks! Thank you Ashley! Such a fun and quirky candy! Love it! So heavenly!! These cups look awesome! Staaaaap! The chocolate-pumpkin combo is my all-time favorite, and I’m dying over this chocolate-covered edible pumpkin cookie dough situation. Can I have 3 to 5 for breakfast, puh-lease? Thankyaverymuch! RIGHT? Isn’t it SUCH a magical combo in your mouth?!? All of the worlds most amazing ingredients packed into one delicious treat?! This look incredible, Taylor! I am so happy you think so! Thanks Emily! Great video Taylor! You totally had me with “pumpkin cookie dough” and then that kettle corn topping just blew me away! Thanks girl! Glad you like the combo! Oh my word what an AMAZING idea! So many recipes use pretzels as a salty counterpart to sweetness, but using kettle corn is genius! Plus cookie dough!? Yes. Please. What? THE WHAT?!! These are freaking brilliant! So many of my favorite flavors! Thank you Becky! Good luck on the Whole30…I still haven’t had the guts to do it! You are so creative Taylor! I would devour 5 of these in one sitting – they look so amazing. Only 5? 😉 Kidding! Thank you! These just stopped me in my TRACKS!! Love it 😉 Thank you! I just died over these! What an incredible combo of flavors! And those photos are stunning, Taylor. Seriously gorgeous. These perfect little treats would make me so happy! Need asap! Yea you do! 😉 Thanks! These are the perfect little bite for when you need something sweet! SO many yummy flavors. Yes! They curb the sweet craving perfectly! Thanks! Oh my gosh, how delicious do these look?! These cups look crazy good!! Perfect bites of heavenly perfection that are calling my name! I neeeed to be snacking on these ASAP! I always love your cute videos, Taylor! And I would TOTALLY be guilty of that chocolate shmear because I too could eat these in one sitting. Kettle corn, pumpkin, chocolate, cookie dough and PEANUT BUTTER, just the BEST combination ever. Thank you for the video love!!! And right?! All my fav foods in ONE BITE. Holy smokes yes please!! I’ll take them all! I’m dying over these! 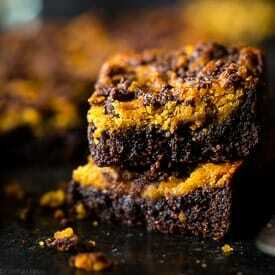 I need to make them!! This is a perfect Fall treat! So many yummy and delicious things going on in these cookie cups! This looks gorgeous, so delicious and very creative Taylor! Haha thank you! It IS dangerous – in a good way!